Doctor Who: The Chicken Little Hypothesis | Warped Factor - Words in the Key of Geek. 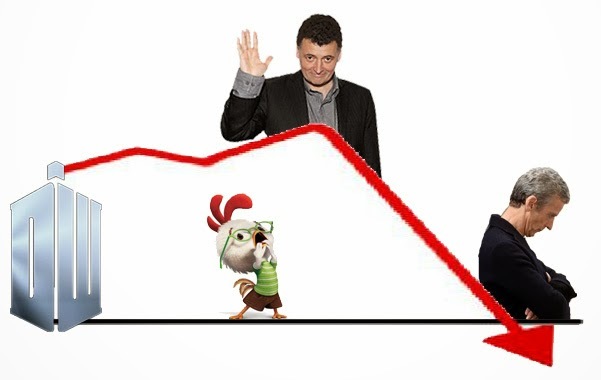 In The Price of Hubris, fans were told that the figures were out, and that the sky was indeed falling as the resident Chicken Littles had predicted, so we’d better all grab our torches and pitchforks and storm the BBC demanding the head of Moffat before the series was crashed into the ground by the showrunner’s hubris. No figures were actually quoted, you understand, or indeed even sourced to support this assertion. But nevertheless, the sky is most definitely falling. Go – go now. Grab your torch, we’ll wait. Now – full disclosure. By what I laughingly like to call trade, I am a journalist. By what I somewhat presumptuously call education, a historian. In both of those disciplines, we fight constantly to take our own agenda out of the equation. If we’ve watched Shakespeare’s Richard III for instance, and come away thinking of the king as a devious backstabbing villain, and then we study him with a historian’s eyes, we have to take the impression of the drama out of our heads. If we don’t succeed in doing that, anything we write about the historical King Richard will be tainted by what is known as Confirmation Bias – undue weight in our analysis given to interpretations of events that favour our pre-conceived notions about people or events. Of course there’s a discipline to news and historical writing which doesn’t need to apply to Op-Ed pieces, where one is allowed, indeed even supposed to pick a side, express an opinion, give a personal reaction to events, stories etc. WarpedFactor pieces should of course frequently be read in this way – we all watch Who as a piece of entertainment, and our views on it will be personal interpretation as much as anything else. But if you’re going to suggest, even in an Op-Ed piece, that A Thing Is Happening, and go on to say This Is Why, then it helps, it really helps, to be able to point at something and say ‘See – this is what I’m talking about.’ Without the evidence, there’s no reason why anyone needs to take your heartfelt belief, your agenda, or your point of view seriously. It’s still yours, and it’s still valid to you. But if you can’t back it up, that’s all it is – a form of polemic, open to refutation without being taken as a personal attack. So I thought it might be fun to actually look at the performance of the episodes of Doctor Who Series 8, compared to previous series. Let’s wander through the evidence for the Chicken Little Hypothesis. The figures here are from BARB, and refer to the UK viewer numbers described in The Price of Hubris as ‘disastrous’ for 2014. They were handily collated by another fansite, Doctorwhotv.co.uk, to which I’m indebted for the legwork, and you can see them for yourself – 2013 here, and 2014 here. So – half and half then. Where’s the disaster? Where’s the sky falling? Bear in mind, we’re not really comparing like for like here either – Smith’s third season had a Doctor at both the height of his powers and, more importantly, the height of public understanding of his incarnation. This was Capaldi’s first season. Perversely, where the skyfall hypothesis gains most ground is comparing Capaldi’s first series with Smith’s first year – at which point, Capaldi wins just a quarter of the episodes on a like-for-like basis. Feel free to check the numbers for Smith’s first series here. The point ultimately is that a like-for-like basis doesn’t really exist between 2010 and 2014. That’s four years of advances in technology and technological take-up, changing the way people enjoy even their favourite shows. Now there’s a way of measuring the different legitimate ways in which people watch Doctor Who within the first week of transmission, so the L+7 figures are a more accurate, more valid way of measuring how many people in the UK are watching the show on its transmission and in the week following. We’ve known for a while that the overnight ratings are an unreliable picture of the true number of viewers – that’s why the ‘final’ BARB numbers are more commonly used. The L+7 numbers are more accurate still. What’s more, with the L+7 numbers, Capaldi comprehensively trounces the rumours and panic-spouting about the end of the world for Who – in fact he beats the Series 7 numbers convincingly in all but two of his episodes – Robot of Sherwood and The Caretaker. So – the sky’s not falling. Doctor Who’s not failing. Even if you take the like-for like ‘final’ BARB numbers, Series 8 was more popular than Series 7 half the time, with the fully-realised Eleventh Doctor pitched against the brand new Twelfth. 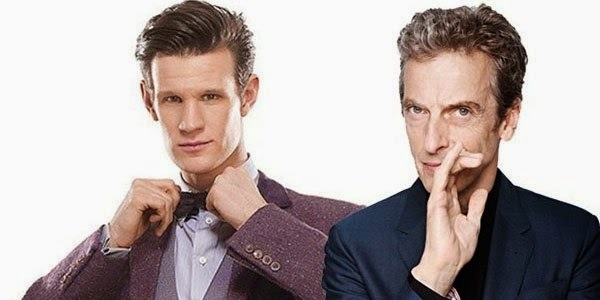 If you accept the validity of the L+7 numbers (and people generally do – a Google search of TV ratings Live+7 is enough to prove that), then Capaldi’s first series took the show significantly forward, sometimes by over 2 million viewers, on the Series 7 figures without L+7 data – which I acknowledge is not a like-for-like comparison. No skyfall, no incipient danger for Doctor Who, no need for pitchforks and torches and Moffat’s head on a spike outside the BBC. If you enjoyed the season, relax – you’re not going nuts. Plenty of people did – It never dipped below the 80s in its Audience Appreciation Index. Oh and that line about BBCA saying figures for the show were ‘steady’ in the US, despite other BBCA shows doing badly and making it look better than it was? It averaged 2.04 million viewers in L+3 ratings (transmission plus the next three days following). That’s better than any previous series of Who. The idea of this being down to other shows doing less well is almost irrelevant – this is nevertheless the fact we find for Series 8. So despite the rabble-rousing of some fans, the ‘trouble’ they claim Steven Moffat has created appears unsupported by the numbers. Hopefully without falling prey to my own Confirmation Bias, having waded through the numbers and taken you with me, I can say that the ‘trouble’ appears to be an invention based on an emotional response – that Who is not the same now as it was when they really loved it, and therefore that it must, surely be failing. It isn’t. Be happy about that. The Chicken Little Hypothesis is a fallacy based on agenda and a lack of appreciation of changing viewing habits.